The other day I was listening to a radio broadcast by a double Phd minister who was being asked about another minister, whether the other was on the up-and-up. The supposed brilliant radio host proceeded to take the other apart saying he was a false teacher and for the caller to stay clear of that man, along with everyone else that didn’t agree with him. Of course he is biblically correct and has the doctorates to prove it. The thing I find interesting is that the man’s program is a half hour long, and the largest percentage of his program is selling his “useful” tools for spiritual growth, and the proceeds going to keep him on the air….right. I guess he really works for free since he doesn’t make any money from his “helpful” tools. 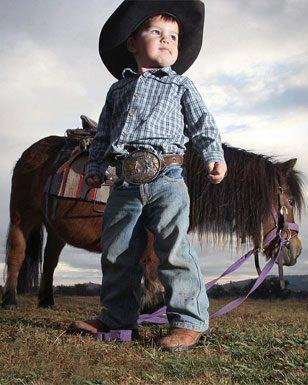 The pic of the little “cowpoke” here is the image I have of this radio host. His plan is to run off all of the false guys, and make sure everyone gets on the same page with himself. He is little man with a lot of knowledge, but little understanding. The results: the only person harmed by his attack is everyone, but specifically, Christ who died for all. I haven’t found being a sheriff, as a spiritual gift in the Bible. It goes beyond that. There are many people that call themselves “watchdogs” over the body of Christ, thinking that they are the protectors of the Faith. In the final analysis, they are the ones that the Word says to beware of, but they don’t know it’s them! His words to us is that we will know the bad guys by the fruit they bear. If a man or woman’s entire message is based on money and profit…their no prophet. If it is Christ centered with a message of profit through prudence, sharing with the needy, supporting your local church, then hear them. Does that make sense? The same goes for the “faith” ministers. If it is a Christ centered message, do like a cow does, eat the hay not the sticks. Every person in ministry will stumble doctrinally. For us to kill each other for the error is demonic. The Holy Spirit dwells in you, He will guide you, if you look to Him. But if you run around chasing all kinds of hot prophets for answers, instead of searching the Word and going the the University of Kneedom, praying for answers, then He will let you search the world over for answers you will not get. He will patiently wait until you surrender and seek Him for the truth. When surrendered, the answers you search for will come in surprising ways…a topic for another day. “Where do wars and fights come from among you? Do they not come from your desires for pleasures that war in your members?” Jas.4:1 The members is not church members, but our own mental faculties, our desire to be doctrinally correct and having the mind of God regarding spiritual truth. It is pride, the pleasure of being right and proving another wrong. We bring reproach on the name of Jesus with our pride of being right, and the world sees our dissention and hatred to each other and skeedattles away from believers, I want no part of that, they often say. Okay, I don’t want this to be a book, just a reality check for us all. One says God doesn’t heal today, that passed away with the apostles. The same goes for all of the gifts of the Spirit, and they can prove it with scripture. The other says God does heal, the gifts of the Spirit are part of the spiritual nature we receive when we believe. One boxes God into a corner, the other allows the flow of spirituality to continue, but doesn’t teach their followers how to “flow,” and then you have all kinds of oddball prophecies and phoney healers among the people of God. One group says Jesus will come back mid-trib, the next group says pre-trib, the other post-trib, and some says He has already returned, headquartered in Salt Lake City, (I’m sure that one is wrong), and each, except the last one has biblical proof, so we devour each other, and the world remains in darkness, our family members are hell-bound, and we hate and lie about it saying, I really don’t hate them, but they are teaching false doctrines! So as long as your are right, the things you and I should be on our knees about don’t really matter. They will matter when we all stand at the judgment seat of Christ. How will we account for our hatred toward each other. This is just another way we use our liberty in Christ, and justify ourselves. Can we agree to disagree about non-redemptive issues? Can we warn each other without naming names? Can we actually follow New Testament conduct doctrines and love each other, and forbear with each other, careful not to cause each other to stumble? If so, this begins revival among in the body of Christ, and fulfill God’s joy as we become one. Even though we still may not be one doctrinally, we love, truly love one another. If not, don’t partake of the Lord’s table. (another topic) Thanks for reading, God bless and keep you all.